With the mobile cone crusher MOBICONE MCO 11 PRO, Kleemann presents the first member of its new high-performance PRO Line. The plant has been designed specially for operation in quarries and is therefore very efficient, accessible for maintenance work and easy to operate. With the PRO Line Kleemann is developing innovative plants which are particularly powerful and efficient and which meet the demands of natural stone processing. The first crushing plant of the PRO generation is the mobile cone crusher MOBICONE MCO 11 PRO. It can process up to 470 tonnes of material per hour. The powerful diesel-electric drive proves to be particularly efficient. The efficiency can be increased even further thanks to the option of an external power supply. Furthermore, the drive concept offers excellent linkage options with other Kleemann crushing and screening plants. The cone crusher was completely redeveloped and achieves its high crushing capacity not least thanks to the 250 kW electric motor, which is used to power the plant. With the fully automatic gap setting it is possible to make adjustments during operation. 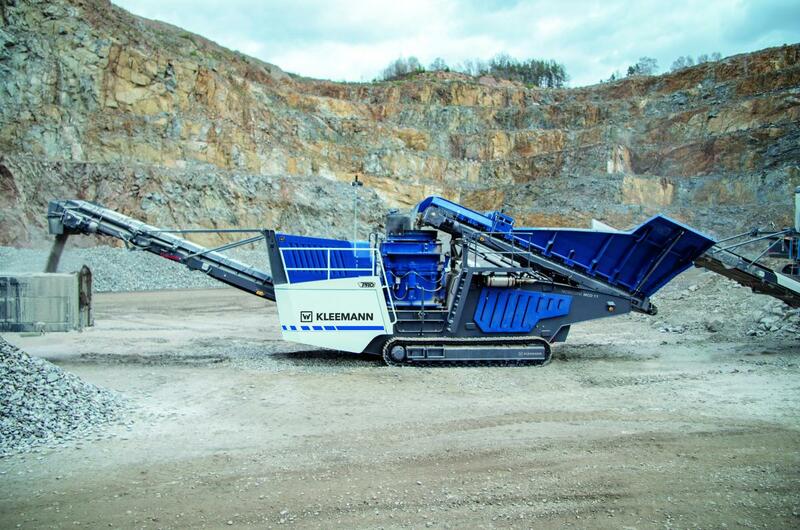 Kleemann attaches huge importance to optimal material flow during the development of new crushing plants. For instance, it can be adapted to the best possible discharge pattern with the hydraulically movable feeding unit. The tried-and-tested Continuous Feed System (CFS) is also used in the MCO 11 PRO: The conveying capacity of the feeding conveyor is adapted depending on the crusher level. The crusher thus always reaches its optimal filling height and a high-quality end product can be constantly produced. If the plant is operated in combination with a Kleemann primary crusher, the CFS also controls the material feed of the upstream crushing stage for optimal utilisation of the entire plant combination. To facilitate the control of the plant, Kleemann developed a brand new operating concept. All components and functions are operated via a 12" touch panel. Status displays and fault locations are shown on the screen in a transparent manner. The plant functions are also clearly illustrated in the menu. The plant operator is guided intuitively through the menu, which makes the control much more convenient. All key components of the drive unit are easy to access at the MCO 11 PRO. For example, the plant operator is able to refuel the plant from the ground. It is also possible to change the crushing tool without sealing compound. This simplifies maintenance and shortens downtimes. A further advantage of the MCO 11 PRO is its ease of transportability: The entire plant can be transported in one piece without the need to disassemble machine parts and is therefore quickly ready for operation.